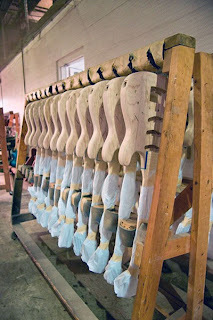 Here are some pics of the new Jimi Hendrix guitars in the production line at Gibson. It's interesting to note that these pics originated from Gibson's website but the company has since taken them down. Leading to some speculation that maybe Gibson is doing an about face and are either working on a re-design -- due to some legal tangles with Fender, perhaps -- or are shelving the idea completely. Even more interesting is that these do not appear to be bolt-on guitars as anticipated. Especially for guitars at this price point. 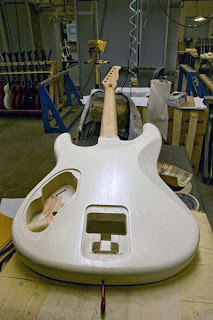 In the first pic we can see a typical Les Paul-type tenon joint in place of a larger bolt-on neck pocket. The quality of the ash wood bodies, I must admit, looks pretty good. Again, surprising for instruments at this price. I was expecting basswood-ply. 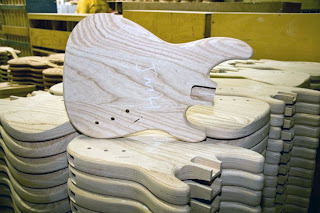 The second pic shows the set-neck/neck-to-body joint and the Authentic Hendrix logo on the back of that oh-so-ugly reverse headstock as well as -- check this out folks -- what appears to be a tremelo cavity that's been routed out backwards! No doubt to accomodate some fiendishly clever new vibrato design! Gasp! Is this a high-end Gibson Jimi Hendrix line in the works? What are we really looking at here? I feel like I'm looking at evidence of an alien presence from Roswell's Area 51.